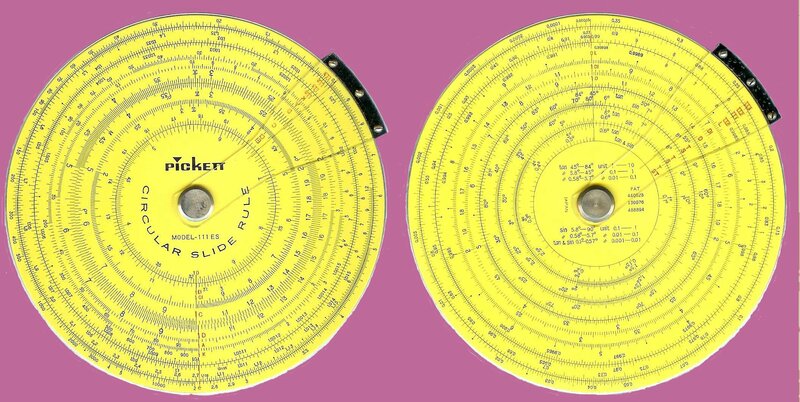 I link to photos hosted by the International Slide Rule Museum, a really great resource. Unfortunately, they don’t set IDs on their pages for specific rules, but luckily I only discuss two brands: Pickett and Faber-Castell. 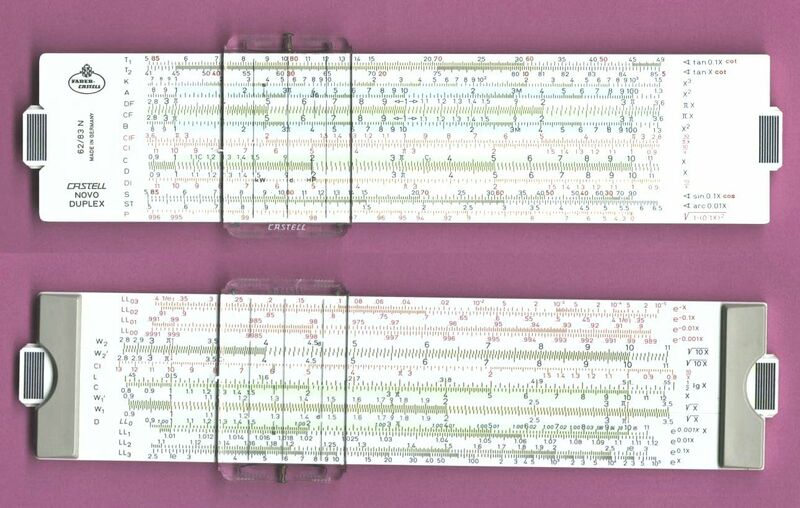 I love slide rules nearly as much as I love HP calculators, and much like HP calculators, I have a humble collection of slide rules that is largely complete. While I keep them around more as beautiful engineering artifacts than anything, I do actually use them as well. These are a few of my favorites, from both a conceptual standpoint and from actual use. This is, by far, the simplest rule that I own. It lacks the K1 scale that even the cheap, student 160-ES/T2 has. Aside from the L scale, it is functionally equivalent to a TI-108. But, to be fair, the TI-108 has two functions that nearly all slide rules lack: addition and subtraction. And, true to the name ‘Basic Math Rule,’ the Pickett 115 has two linear scales, X and Y, for doing addition and subtraction. Additionally, it has one scale-worth of Pickett’s ‘Decimal Keeper’ function, which aids the user in keeping track of how many decimal places their result is. All in all, it’s not a particularly impressive rule, but it is quite unique. Faber-Castell made a version of the Castell-Mentor 52/80 (unfortunately ISRM’s photo is not that version) with linear scales as well, and I probably prefer it in practice to the 115. The 115 just has a wonderful sort of pure simplicity about it that I appreciate, however. This is basically the next step up from the aforementioned 160-ES/T. The 160-ES/T is a simplex with K, A, B, C, CI, D, and L scales. The N200-ES/T is a duplex model that adds trig functions with a single set of S and T scales, and an ST scale. It’s a wee little pocket thing, the same size as the 160-ES/T, and it’s made of aluminum as opposed to plastic. It’s nothing fancy, but it handles a very useful number of functions in a very small package. The N600-ES/T does even more, but it becomes a little cluttery compared to the N200-ES/T’s lower information density. Good for playing with numbers in bed. 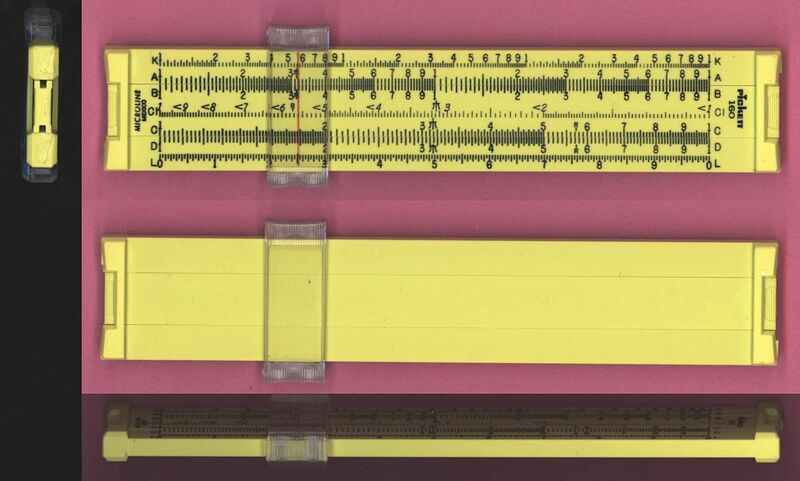 The 2/83N is, in my opinion, the ultimate slide rule. It has 31 scales, conveniently organized, and with explanations on the right-hand side. Its braces have rubberized strips on them, and are thick enough that the rule can be used while sitting on a table. The ends of the slide extend out past the ends of the stator so it’s always easy to manipulate (I don’t have any Keuffel & Esser rules on this list, but they had a clever design that combatted this problem as well, with the braces being more L-shaped than C-shaped). The range of C (and therefore everything else, but this is the easiest way to explain) goes beyond 1-10, starting at around 0.85 and ending around 11.5. The plastic operates incredibly smoothly (granted, I bought mine NOS from Faber’s German store a few years ago, that had to have helped), and the whole thing is just beautiful. Truly the grail slide rule. This feels like a complete cop-out, because it is essentially identical to the 2/83N, except smashed into half of the width. You lose the nice braces, you get a slightly less-fancy cursor, and you lose precision when you condense the same scale down to half-width. But you end up with something ridiculously dense in functionality for a small package. Even though it’s essentially the same rule as the 2/83N, I think it deserves its own place on this list. This was the piece I’d been looking for to essentially wrap up my collection. 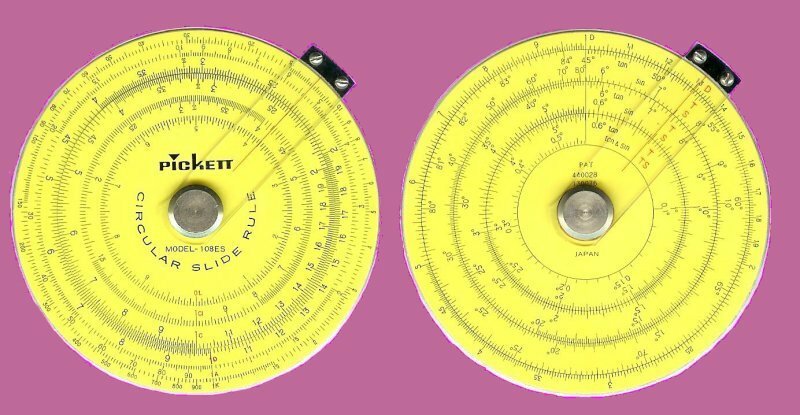 It is a circular, or dial, slide rule, and it is tiny – 8cm in diameter. It’s much harder to come by than the larger circular Picketts, particularly the older 101-C. Circular rules have some distinct advantages – notably their compact size (the 108-ES is the only rule I own that I would truly call pocketable, and it cradles nicely in the palm of my hand), and the infinite nature of a circular slide. The latter advantage means there’s no point in adding folded scales, nor is there ever a need to back up and start from the other end of the slide because your result is off the edge. The 108-ES, by my understanding, was a fairly late model, manufactured in Japan. It is mostly plastic, and incredibly smooth to operate – moreso than non-circular Picketts that I’ve used. The obverse has L, CI, and C on the slide; D, A, and K on the stator. The reverse has no slide, and has D, TS, three scales of T, and two of S. I can’t help but hear “I’m the operator / with my pocket calculator” in my mind when I play with this thing. It really packs a lot of punch for something so diminutive. The larger 111-ES, of the same sort of manufacture, is also quite impressive with (among other things) the addition of log-log scales. The Sinclair Scientific is one of my favorite calculators, though certainly not for its speed, accuracy, or feature set. In fact, in an era where full-featured scientific calculators can be had for under ten bucks, it’s a downright laughably bad machine. But it’s evidence of the ingenuity of Sinclair in their race to have made tech accessible for those with slimmer wallets. The Scientific may well be a post for another day, but recently I fell into another ridiculously quirky Sinclair calculator, the Scientific Programmable. Its manual describes it as ‘the first mains/battery calculator in the world to offer a self-contained programming facility combined with true scientific functions at a price within the reach of the general public’. As with the Scientific, that last bit is key – this machine was engineered to meet a price point. HPs of the day were engineered for speed and accuracy, and were beautiful, easily operated machines to boot. Sinclairs were affordable, period. To start investigating this thing’s quirks, let’s address the ‘true scientific functions’ that the calculator includes. Sine, cosine, arctan, log, and antilog. No arcsine, arccos, or tangent – instead the manual tells you how to derive them yourself using the included functions. Precisely what I expect from a Sinclair (though the aforementioned Scientific did include all standard trig functions). The highlight (if you will) of this calculator is, of course, its ‘self-contained programming facility’, which is really what I’d like to discuss. While the terms are oft indistinguishable nowadays, I would really consider the Scientific Programmable’s functionality more of a macro recording system than anything resembling programming. There are no conditionals, there is no branching, and a program can only contain 24 keystrokes. The keyboard is shifted for program entry, and integers thus require two extra keystrokes as they are delimited. I say integers because that is all one can enter during program entry – if your program requires you to multiply by .125, you would need to calculate that with integer math first. My go-to demo program is Viète’s formula for pi. It’s simple, requiring very little in the way of scientific functions, stack manipulation, memory registers, or instructions; yet it’s fun and rewarding. Unfortunately, I don’t actually think it’s possible on the Scientific Programmable, primarily due to the lack of a stack and the single memory register. I just need one more place to stick a value, and a stack would be ideal – it would contain the previous result ready to be multiplied by the next iteration. We could try pi the Leibniz (et al.) way, 1 – 1⁄3 + 1⁄5 – 1⁄7 + 1⁄9, and so on. But we still need to store two variables – the result of every go, and the counter. I still don’t think it can be done. How about we eschew pi and just make 3. Easy enough, just type 3 or, perhaps 69 enter 23 ÷. But what if I want to do it Ramanujan-style with more nested radicals? I… still don’t think I can, because again I essentially need a decrement counter. Bit of the inverse of the problem as above, one place for storage just isn’t enough. Sorry, Ramanujan. So what can we do? I guess the golden ratio is simple enough: ' 1 ' + √ and then just mash EXEC repeatedly until we have something resembling 1.618. Not terribly satisfying. Also, the calculator lacks the precision to ever actually make it beyond 1.6179. To be fair, the calculator (well, not mine, but a new one) comes with a program library in addition to the manual. Katie Wasserman’s site has them, fortunately. And while none of the programs are particularly interesting in any sort of technical way, they do give a good overview of how this macro mentality would cut down on repetitive calculations. One thing that I do find technically interesting, from a small systems/low level perspective is Sinclair’s advice on dealing with the limitations. For instance, they mention that pi is 355⁄113 which yields 3.1416, as accurate as is possible. But if one is willing to deal with less accuracy, they suggest 4*(arctan 1) for 3.1408 (~.02%) or 22⁄7 for 3.1428 (~.04%). Determine needs and spend memory accordingly. All in all, I don’t know what I’ll do with the Scientific Programmable beyond occasionally pulling it out to mess with. It’s not really fun to program like an old HP, because it’s just too limited. I guess if I come up with any other simple, iterative formulas that I can plug into it, I may revisit. But, much like the Sinclair Scientific, it will largely stay in my collection as a quirk, a demonstration of what was ‘good enough’ alongside the cutting edge. Even though I generally have an HP or two handy, the POSIX command-line RPN calculator, dc, is probably the calculator that I use most often. The manpage is pretty clear on its operation, albeit in a very manpagish way. While the manpage makes for a nice reference, I've not seen a friendly, readable primer available on the program before. This is likely because there aren't really people lining up to use dc, but there are a couple of compelling reasons to get to know it.